Held every Saturday from 7.00am – 1.00pm under the Raintrees, Foxton Avenue, Mossman. Come along to the Mossman Markets and purchase fresh local produce straight from the farm. There are many stalls with beautiful local organic produce and handcrafted items. 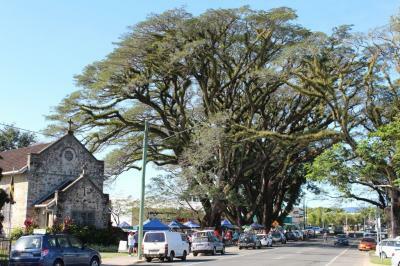 Come enjoy this relaxed country market with locals and visitors positioned under the shady canopy of the huge Raintrees and next to the historic St David’s Church. Accessibility is generally good, with nearby and limited accessible parking available. A public accessible toilet is located next to the All Abilities Play Ground opposite the market. There are no regular paved pathways between the market stall therefore the ground may be uneven and assistance may be required depending on an individual’s capacity and particular needs. For more information on stallholder space and general enquires contact the Market Coordinator (Joan Vico) on 4098 4917, or Fr Kenneth 4098 2672 or email mossmanmarket@gmail.com.